Oil on canvas mounted on panel. This portrait in oil has been the subject of numerous studies and differing opinions regarding its attribution and the sitter’s identity. It was attributed to Hans Wertigner until 1969 when Christian Salm gave it to a painter in the circle of that artist. Despite the inscriptions in the upper part of the work, the sitter’s identity remains unknown although the portrait has been related to one of William IV of Bavaria in the Alte Pinakothek in Munich. However, the two figures bear little resemblance to each other. The present sitter is depicted in three-quarter length against a green background against which his figure stands out. He is dressed in a sober, elegant manner although the artist also included a few decorative elements such as the hat and the handle of the sword in the lower part. The features of his skilfully modelled face are, however, severe. Located just above the head is a crown with eight flames and the initials “W” and “V”, which may refer to the sitter’s identity. This portrait of a man, who remains unidentified despite the inscriptions on the image, entered the Collection in 1929 and is one of the few purchases made before 1930 on which information survives regarding its acquisition. In a report dated 15 November 1929, now in the Museum’s archive and written after the painting’s acquisition, Buchner attributes this oil to the court painter Hans Wertinger, considering it to be an interesting work. 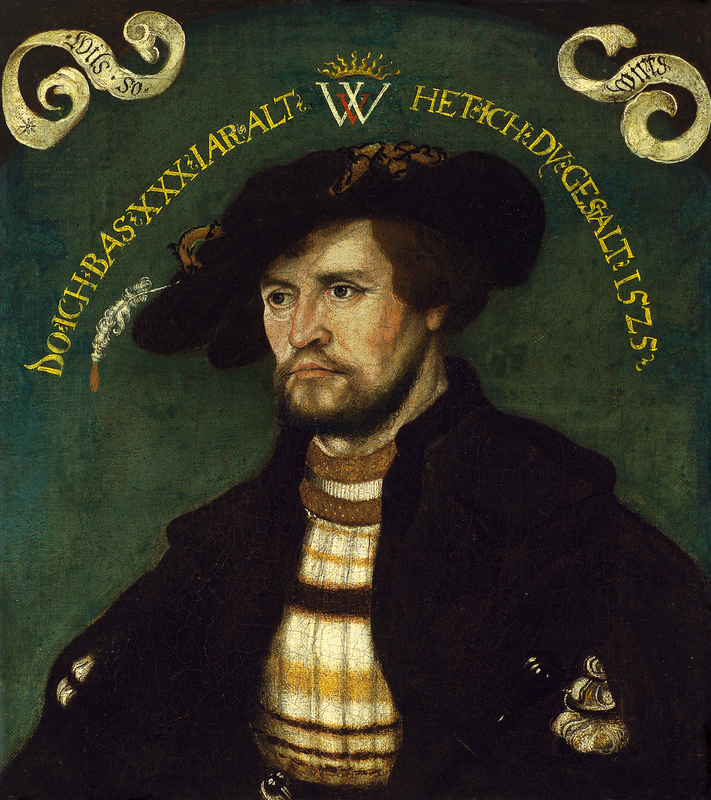 In his report Buchner identified the sitter as Duke William IV of Bavaria, basing his identification on a comparison with a portrait by Wertinger dated 1526 in the Ferdinandmuseum in Innsbruck. The painting was catalogued with this attribution and identification in the catalogues of the Thyssen- Bornemisza collection of 1930 and 1937. 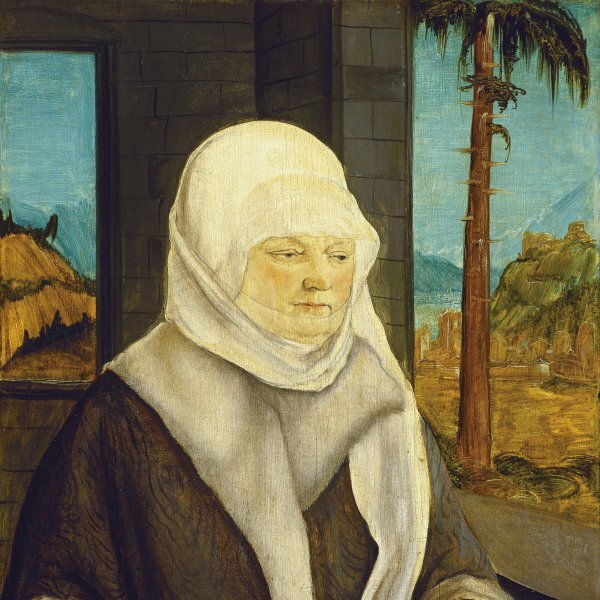 Over the subsequent years both the sitter’s identity and the attribution were questioned starting in 1942 when Karl Feuchtmayr questioned the attribution to Wertinger. In the catalogue of the Collection of 1969, Christian Salm published the painting as a portrait of a man aged 30 by the circle of Wertinger, arguing that the sitter was not wearing clothing appropriate to the rank of duke. 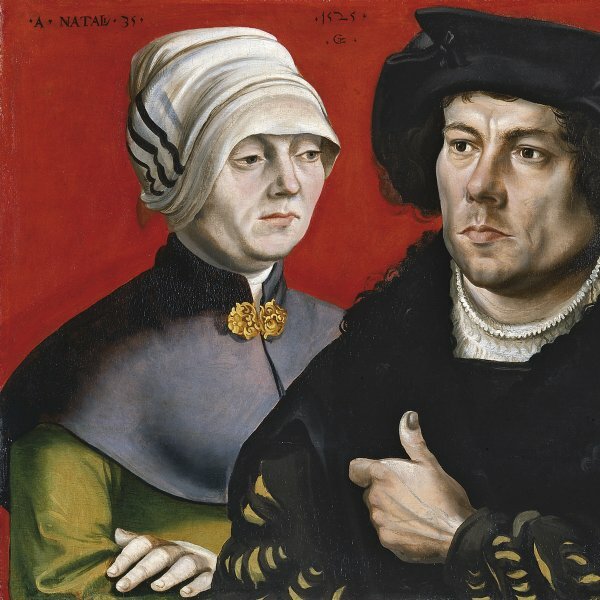 The Alte Pinakothek in Munich has a portrait by Wertinger of 1526 depicting William IV of Bavaria which forms part of a diptych with a portrait of the Duke’s wife, Maria Javobaea of Baden. This image shows the Duke in regal dress and wearing a splendid necklace. In addition, the Duke in that image and the present sitter are not comparable physically. William IV, eldest son of Duke Albrecht IV of Bavaria and of Kunigunde of Austria, sister of Maximilian I, was born on 13 November 1493 in Munich and died on 7 March 1550. In 1525, the date at which this painting was executed, he would have been 32. The present model, set against a green background with an arched top, is elegantly dressed. The rigorous black of his wide hat and clothes is offset by a white shirt with horizontal stripes that is visible through the slashed sleeves. The hat has some discreet decorative details that also counterbalance the dark colouring of the clothes. At the lower edge it is just possible to see the hilt of a sword on the right and that of a dagger on the left. The sitter’s face is finely modelled although some of his features are slightly harsh. In the centre of the image just above the head Wertinger painted a crown with eight flames emerging from it and the initials “w” and “v” below it in red and white. This detail may be one of the keys that will enable the sitter to be identified.